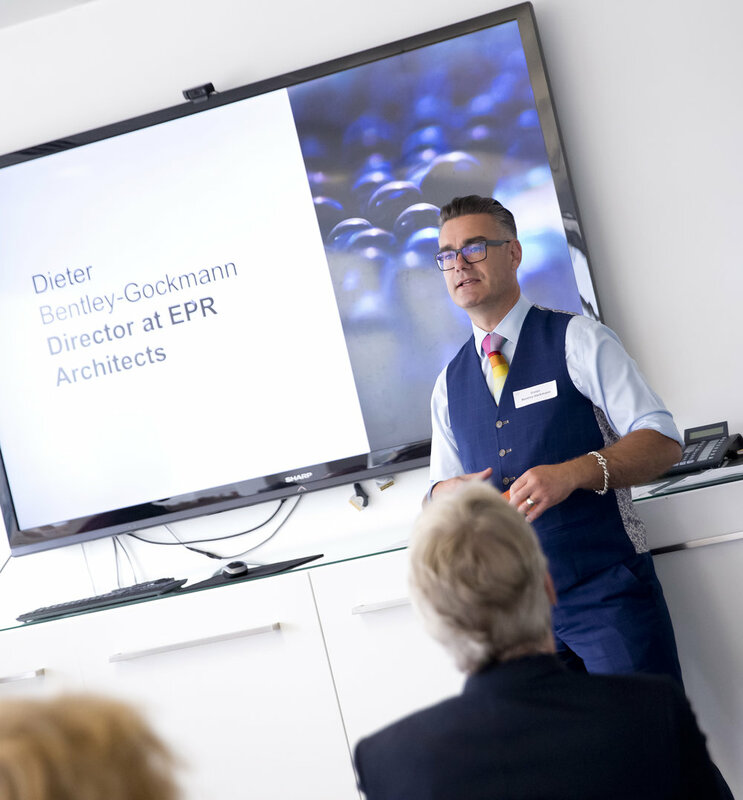 Dieter Bentley-Gockmann, Director at EPR Architects, is a passionate advocate for diversity and inclusion (D&I) and a mentor with Built By Us’ FLUID programme. We caught up with Dieter to talk about inspiring LGBT+ role models, vital mentoring schemes and the importance of lasting corporate D&I strategies. Dieter is a passionate advocate of diversity in the workplace and a founding member of Built By Us (BBU)’s FLUID Diversity Mentoring Programme. And, crucially, his passion for creating strong industry role models from all backgrounds is personal – he draws on experiences in the early years of his career to explain why he is committed to giving young people from underrepresented groups the support they need to succeed. Dieter began his career in architecture in the 1990s, graduating from the Welsh School of Architecture, Cardiff University. He practiced architecture in central London after graduating, before completing a Master’s Degree in Construction Law and Arbitration at King’s College, London. His unique experience and industry insight eventually led him to join EPR Architects in 2006, where he was promoted to Director in 2007. Dieter is also Chair of the RIBA regulatory standards advisory group following the Grenfell Tower disaster. While at University, during his year in industry, Dieter remembers receiving unpleasant homophobic remarks that began to impact how he presented himself in the workplace. He found that the experiences of his year out had left their mark – he recognised that he was projecting self-limiting beliefs into his daily work, shaped by how he believed other people perceived him. As he progressed in the sector, he began to realise that young LGBT+ industry professionals were still experiencing these challenges and that they continued to affect their confidence and career paths. Dieter recognised that young LGBT+ architects, and those from other underrepresented groups, would benefit from hearing the stories of those who had gone before them. Far from shying from sharing his career journey, he threw himself into supporting those in the fledgling stages of their careers. In 2013, he began working with Danna Walker, fellow architect and founder of BBU, to support architects and other industry professionals. The resulting FLUID programme has now been running for 6 years, helping built environment professionals reach their potential. Dieter is currently in his third cycle of mentoring with FLUID. His very first mentee came to him stuck in her career, and lacking confidence. Following her time on the programme, she is now Director of a successful architecture practice – thanks in many ways to Dieter’s support and advice. Inspired by his involvement with the FLUID programme, Dieter has helped introduce a mentoring scheme at EPR. This internal programme helps young professionals as they start to make their way up the career ladder. EPR has also commissioned BBU to create a high-level D&I business plan. Together, the two organisations are looking to create a long-term solution to D&I challenges, embedding change in an organic way that works with EPR’s business model and that of its supply chain. As part of a holistic plan, including role models and mentoring support, Dieter believes this will create lasting change in his organisation.